The draw of the hackathon is different for everyone. Having not attended the inaugural #QBHack last year we were both excited by the opportunity and curious about the draw. 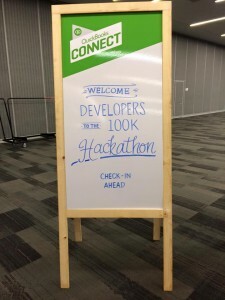 From teams of one to teams of twelve, comprised of accountants, developers, designers, entrepreneurs and more, the @IntuitDev team did an amazing job of not only putting on a world class event, but going the extra mile to help every team get to the finish line. In just under 36 hours and fueled by entirely espresso, tea, redbull, cabernet, death metal and some heavy beats, we accomplished a feat few get to experience. To take an idea, build it, pitch it then have it vetted and lauded in less than 48 hours is truly remarkable and a bit difficult to describe! Having the opportunity to discuss our product and vision with @IntuitBrad & Scott Cook in addition to the feedback we received from so many #ProAdvisors was amazing! Now is the time we take that encouragement, feedback and excitement to focus our energies and deliver that complete vision. So stay tuned! Thanks goes out to the @Intuit family for putting on such a great event, curating an amazing developer ecosystem and providing devs and businesses alike the opportunity to succeed! Until Next year!